I’m in the middle of a bathroom remodel, so things have been hectic in my world. But beyond the noise and dirty house, how much value is this going to add? If I spend $15,000, my home will be worth $15,000 more, right? Let’s talk about it. Dollar for dollar: It’s rare in real estate to spend a dollar and get a dollar back in value. It seems like it should be easy to increase value like it is on HGTV, but even if you look at the Remodeling 2018 Cost vs. Value Report, hardly any items on the list give close to a 100% return compared to the cost. For instance, a bathroom remodel is said to only add 68.2% of the cost to the value, and an upscale kitchen remodel is said to only recoup 46.5% of the cost in the resale market. Yikes. That’s pretty far from 100%. Tub example: Here’s an example about cost vs value. Tubs like this can easily run $3,000 to $5,000 for just the tub alone, and based on conversations I’ve had with owners it’s not uncommon for someone to have spent $6,000 to $15,000 for a set-up like this. The tub is wonderful for someone who needs it, but in terms of value it might add very little if anything (classic functional obsolescence). In fact, many buyers might count it as a negative because it’s something they’ll likely tear out. Thanks Gail Robards for the photo. Big point: I’m actually not a huge fan of published cost vs value lists because I wonder where the data comes from. Also, do the numbers make sense in every neighborhood and price range? Probably not. Yet I find these lists are still useful in conversations. An owner might say, “I spent $22,000 on a bathroom remodel, so my home is worth $22,000 more now.” Well, firstly let’s realize the remodeling lists don’t even give you $22,000 in value, so it’s probably a good idea to lower expectations (before the appraiser gets out there especially). Most of all, let’s look to the comps with similar features. Are they selling for $22,000 more? That’s what matters most because real estate value is about what buyers are willing to pay for something – not the cost. Thus an owner might have spent $70,000 on a remodel, but what are buyers paying for similar remodeled homes in the neighborhood? That’s the most relevant question, and one which appraisers will focus on when coming up with a value. My bathroom remodel: Here are some progress shots for my bathroom remodel. We went with a tile floor that looks like wood, subway tile in the shower (classic look in my mind), and a white quartz counter. This bathroom only had a stand-up 1950s shower, so part of the remodel involves moving the shower to the existing tub. This left a huge space, so I’m building out shelves in the old shower. Eventually these shelves will be stained a darker brown to match everything. And this is Ollie, our rescue dog. Questions: What types of conversations do you tend to have about cost vs value? Have you ever used actual cost vs value figures like this to help conversation flow? I’d love to hear your take or any stories. Competitive. Normal-ish. Price sensitive. These are all words that describe Sacramento’s housing market right now. Let’s take a look at some of the latest trends so we can better understand and explain how the market is unfolding. The market is showing a fairly normal and steady seasonal uptick in price. Whether you look at median price, average sales price, or average price per sq ft, there has been an increase in recent months. The market has seen about a 4% increase in prices over the past four months, yet at the same time many are describing the market as fairly flat since some neighborhoods are not seeing much of an uptick at all. Remember that just because county-wide stats show a 4% recent increase does not necessarily translate into 4% value increase for each property. 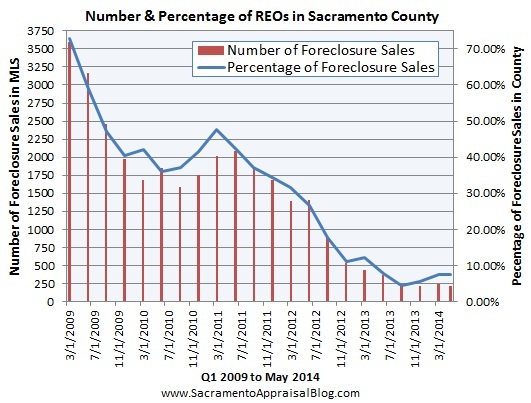 From April to May, sales took about one week longer to sell in Sacramento County. In contrast, Placer County and the Region showed very little change in cumulative days on market. Generally speaking, the more expensive the property, the longer it is taking to sell. Overall, the market is price sensitive, which means if properties are not priced correctly, they are sitting. Expect this trend to continue so long as inventory increases in coming months. 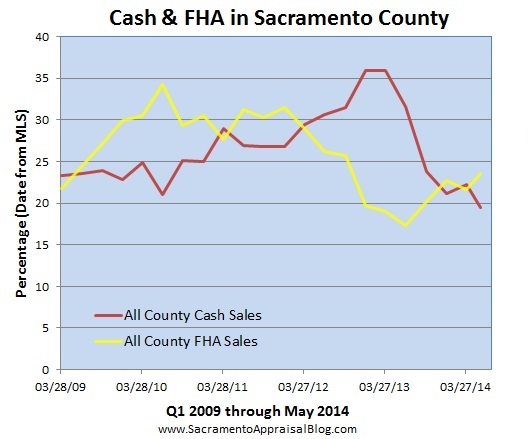 Housing inventory increased from 1.80 months to 2.0 months in Sacramento County from April to May 2014. Inventory is still very low, which is making competition aggressive in certain price ranges. Different price ranges experience different trends. This is clearly seen since inventory isn’t the same at every price level.The market is very competitive under $300,000 right now, but anything above $750,000 is far less competitive. There was little change from last month for properties under $500,000, though above $750K saw some increases. Take the 24 months of inventory above $1,000,000 with a grain of salt since there were only 3 sales in this price range last month, but there are 20 or so pendings right now. Ultimately this million-dollar stat is skewed, but it’s still safe to accurately say there is one year or more worth of houses for sale above $1,000,000 in Sacramento County. Sales volume is down compared to last year, but sales in May were about the same compared to April. In the next few days as more sales are entered into MLS, I suspect sales volume for May will increase beyond volume in April. After a very sluggish start to the year in terms of sales, it’s nice to have two consecutive months of more than 1400 sales. Of course volume is still significantly lower than previous years, and that is something to continue to watch over time. Cash sales used to represent closer to 35% of all sales in the county just one year ago, but now they’re only 19.5% of all sales (for April & May 2014). Cash investors were a very significant driver for the market, but now the market is no longer being driven by cash. When cash investors took their foot off the gas pedal one year ago, it got much easier for FHA and conventional buyers to get into contract. The market is still very competitive since inventory is low, but owner occupant buyers have much more of a fighting chance these days. Both short sales and REOs have decreased dramatically in recent years and are definitely not driving the market. Banks are tending to spend more time and money fixing up their REOs, while short sales are often still priced aggressively low. REOs have shown a slight uptick recently (especially considering the most recent “quarter” is only comprised of two months of sales. This isn’t anything to write home over per se, but something to watch over time to see how it evolves. Interest rates showed a slight decrease over the past month, and that is something that will help prices be slightly more affordable. In light of massive price increases over the past couple of years, affordability is becoming a challenge for many buyers. The real estate market has many “layers” that impact value. Last year the market was heavily influenced by interest rates, cash investors and incredibly low inventory, but things have shifted in 2014. Right now some of the main drivers to watch over these next two quarters are the job market, interest rates, inventory and affordability. Local real estate can no longer be so heavily driven by outside cash investors, which means it will be more sensitive to the health and strength of the local economy. Prices increased over the past two years, but not because people are making more money. How does that strike you? Summary: Our market has slowed down quite a bit from last year. The market is still competitive, but it is very price sensitive. Real estate is still “hot”, but it is definitely cooler than last year in that days on market has increased, inventory doubled, interest rates are higher than they were, and cash investors are much less of a factor. By the way, I’ll share more Placer County and regional trends in a few days. 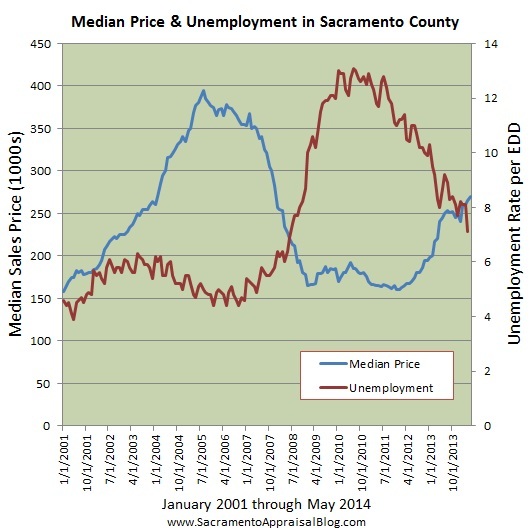 Let’s take a look at the way price and inventory have worked together over the past thirteen years in Sacramento County. There are of course many factors or “layers of the cake” so to speak that impact real estate values, but housing inventory is definitely a key indicator. Key Takeaways: I know I can be crowned Captain Obvious for saying this, but values tend to increase when inventory is under two months. This has historically been an important level for upward trending values in the Sacramento market, which is important to consider since we are now at 2.1 months of housing supply. Basically, since the year 2000, when inventory has been under three months, the market has felt strong. On the other hand when supply has hovered above four months, values were usually stable at best or declining. There are of course many indicators to consider for a housing market, so it can be dangerous to isolate only one metric like inventory. However, it’s worth considering what the local market will look like with three or four months of housing supply. Keep these numbers in mind as the market continues to unfold. Any thoughts? I’d love to hear your take in the comments below.